Jinkee Pacquiao had to be restrained from going near husband Manny Pacquiao after the latter was knocked out by opponent Juan Manuel Marquez in their 4th bout (Pacquiao vs Marquez 4) held earlier in Las Vegas. The loving wife Jinkee Pacquiao cried buckets and went hysterical at the ringside. She wanted to get near, tried to reach Manny Pacquiao the moment she saw him dropping down inside the ring. So heartbreaking to see Jinkee Pacquiao in the above photo (screen shot by Ces Drilon). 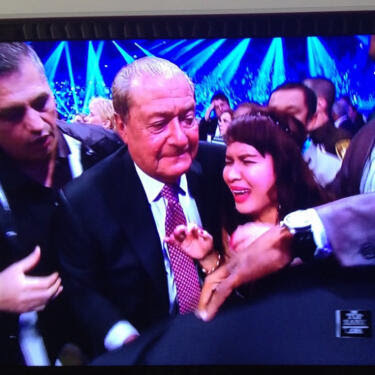 And I guess it's even more heartbreaking than Pacquiao's loss. It's double the pain for Jinkee. Jinkee never cried this much in the whole span of Manny Pacquiao's boxing career. Who wouldn't? Seeing your husband lying motionless inside the ring? That's too much to bear. '24/7 in Love' Movie a box office disappointment?